One of Brazil's top natural attractions, the Abrolhos Marine National Park encompasses four of the five islands which make up the Abrolhos archipelago: Redonda, Siriba, Sueste and Guarita. One of the islands (Santa Bárbara), which holds the Abrolhos lighthouse, is under the jurisdiction of the Brazilian Navy. The Abrolhos Marine National Park, with an area of approximately 352.51 square miles and managed by ICMBIO (the Chico Mendes Institute for the Conservation of Biodiversity) was created in 1983 and protects the richest biodiversity in the Southern Atlantic Ocean. The archipelago is an important breeding and calving area for humpback whales and part of the Bahia shores known as the Whale Coast (Costa das Baleias). Within the limits of the national park is Parcel dos Abrolhos, the archipelago's coral reef with mushroom-shaped formations, known as chapeirões, between 5 and 25 meters tall. 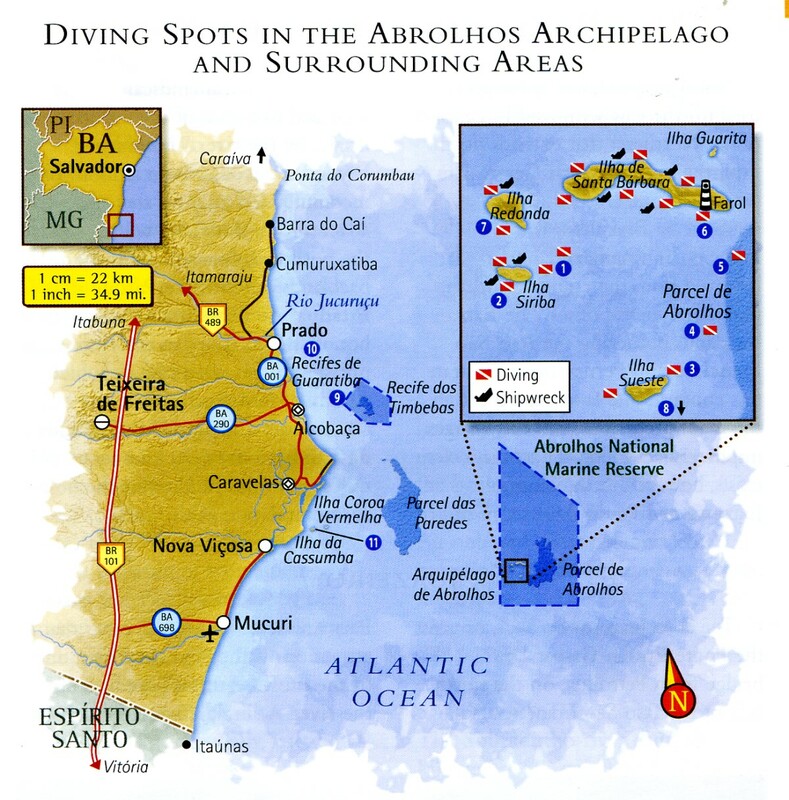 Also protected is the Timbebas Reef, directly across from Alcobaça. The name Abrolhos is said to come from "Abre os olhos" (open your eyes, or keep your eyes open) - a sailor's warning in an area rich in coral reefs. The lighthouse built in the 1860s, which is well-preserved but not accessible to visitors, helped navigation with its range of 20 nautical miles. Charles Darwin noted the profusion of coral reefs, including brain coral, and wildlife - reptiles, spiders and totipalmate birds - when he carried out some studies in Abrolhos in 1830 as part of his voyage aboard H.M.S. Beagle. Birds are plentiful on all the Abrolhos islands. Masked booby (Sula dactylatra; brown booby (Sula leucogaster); and red-billed tropicbirds (Phaethon aethereus are among the species that nest in Abrolhos. The park is also an RBMA, a unit of Atlantic Forest Biosphere Reserve where at least two of the three essential functions of this type of reserve are carried out: conservation of biodiversity, promotion of sustainable development and permanent monitoring.